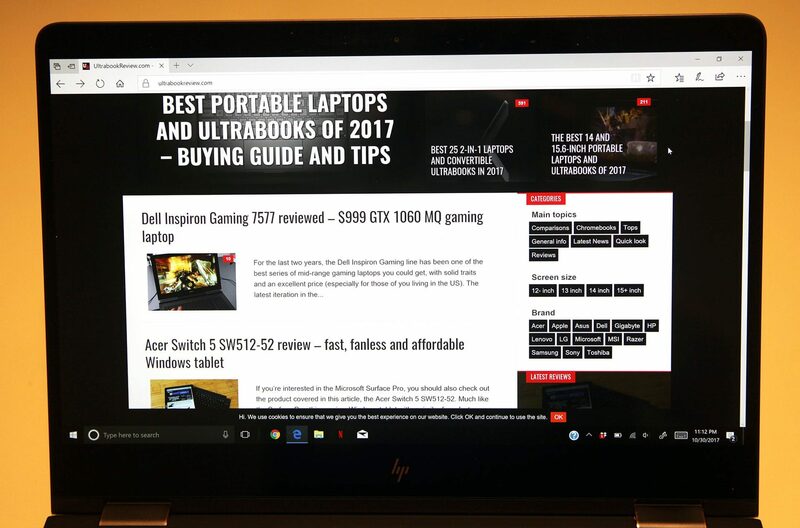 Summary: I’m very pleased with what the HP Spectre x360 15t has to offer. Considering how portable it is, this laptop has a lot of horsepower behind it, and does so without making too many compromises. 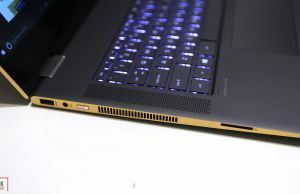 My biggest concern is the thermal throttling when you push the laptop to its limits, but I don’t think this will affect many people, as it only seems to happen during benchmarks and maybe some really heavy gaming – both of which really aren’t what this laptop is for. 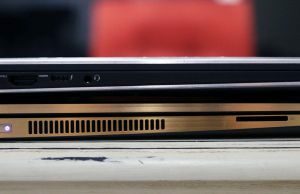 The 13” version of the HP Spectre x360 was arguably my favorite laptop of 2017, as it offered the most bang for the buck when looking for a high quality three-in-one ultrabook. Really, the only thing I thought was missing in the unit I had was the absence of pen input (which was further addressed by the updated configurations launched towards Spring). So it’s no surprise I would be interested in the 15” version of the x360. Not only does it include an active digitizer, but it also has dedicated graphics. On top of that, it has a refreshed Kaby Lake quad core CPU, which is designed for ultrabooks and optimized for better battery life. I’m mainly interested in this laptop because I think it’s a good alternative to the XPS 15. It’s not quite as portable, but it’s darn close and certainly more versatile. The GPU isn’t as powerful, but that might not be a big deal to many people, especially since the battery life is sure to be better. After a couple weeks, I’ve formed a strong opinion of this laptop. Read below to see what I found out. 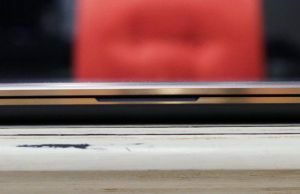 In a lot of ways, the 15″ Spectre x360 looks very similar to the 13″ version – and that’s a good thing! There are however a couple of subtle differences that make it slightly inferior to its smaller brother. Starting with the chassis, it’s an all aluminum design. 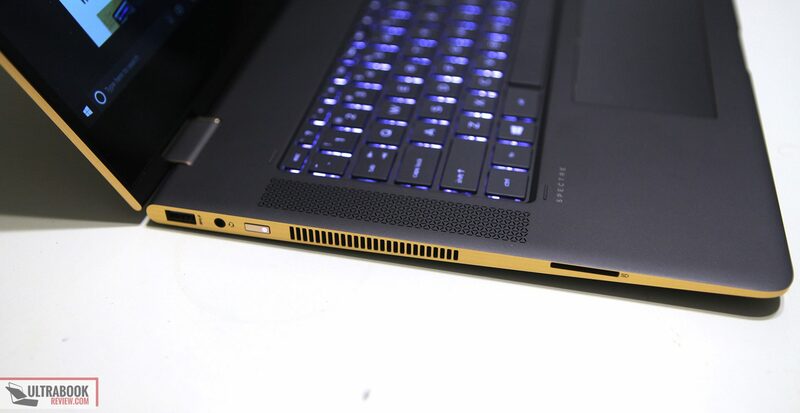 The aluminum is an anodized charcoal color and the entire laptop has hints of gold highlights in various places. Overall, it’s a nice touch, however it being dark makes it slightly prone to fingerprints. Handling the laptop is very nice, as it’s well balanced and very symmetric for the most part. The surfaces are very smooth and there are hardly any gripping points, so you may want to be careful when picking it up as it can be a little slippery at times. For the most part, this Spectre feels high quality and well built, even as if it can take a drop or two. The lid does have a little flex though. If I squeeze too hard when holding the device, I can definitely feel some level of flex. I don’t feel like I could break it from squeezing too hard, but it’s just a minor annoyance. 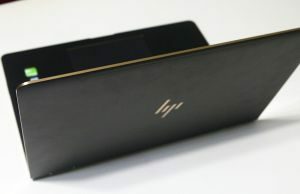 The lid is pretty much just a smooth piece of charcoal colored aluminum, with a shiny gold HP logo centered on it. The top has a very small plastic strip, which most likely houses the WiFi antenna. Once you get that lid opened though, it’s quite a nice sight. Up top is a 4k touchscreen, with some very small bezels(more on the screen later). The side bezels are extremely thin but the top and bottom bezels are still average sized. It’s not quite as thin as the XPS 15, but it’s a step in the right direction. In fact, I’d rather have a little larger bezel if it means having a FHD Windows Hello webcam up top, like this model has. Centered below the screen is a small gold HP logo. 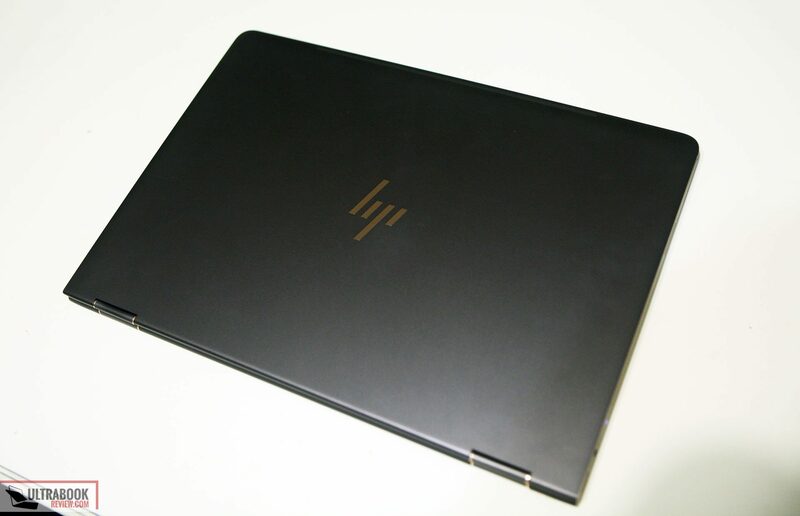 The palm rest is pretty typical and looks just like on any other HP laptop, especially business models. In fact, I use an HP Zbook for work and the layout is pretty much identical, with the exception of the touchpad of course. The speakers are on both sides of the keyboard and are upward facing. The touchpad is below the space bar and is very large, which is typical for the Spectre line. 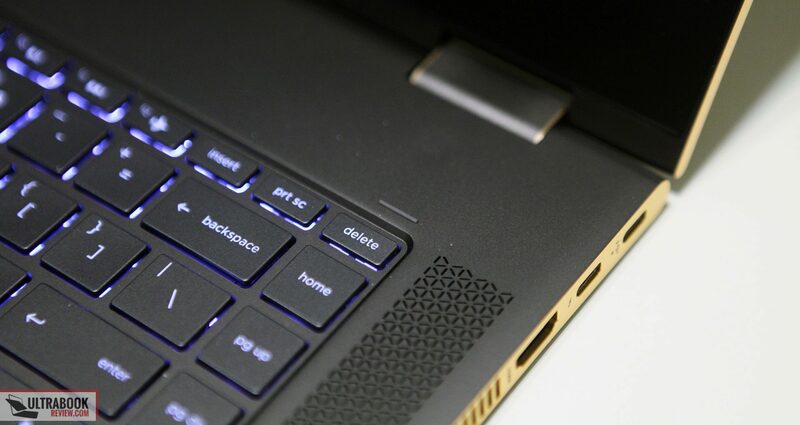 All the edges of the laptop have a polished gold finish. As far as the IO goes, there’s nothing on the front and back edges, but there are some limited options on the sides. The left side has a single USB-A port, a mic/earphone combo and a SD card reader. The right side has a Thunderbolt 3, and additional USB-C 3.1 port and an HDMI port. It’s not much, but it’s enough for most people. The bottom meets my biggest concerns about this laptop. The feet that HP decided to use are way too short and it results in the belly touching the surface you are putting the device on, even if it’s smooth. In fact, I’m using it on my desk right now and I can’t even slide a sheet of paper underneath, between where the feet are. When I slide my laptop, I can definitely feel it rubbing on the surface of my desk. This would undoubtedly cause scratches over time – something you will easily see on a dark colored laptop. Like the 13-inch version, the Spectre x360 15t is designed to be used in multiple different modes: laptop, tent, presentation and tablet. 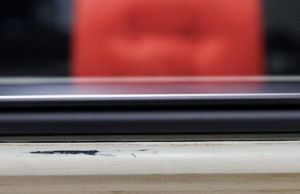 Being the careful person I am, I would be hesitant to put the laptop in either presentation or tent mode, as the contact edges risk getting scratched. I don’t think the shiny gold lip will look so shiny after a few months of putting it into tent mode without checking for a clean surface. The tablet mode is pretty cool though, especially since there aren’t a lot of 15″ tablets out there. It’s a heavy tablet though, weighing in at over 4 lbs, so don’t expect to be handling it one handed as you would an iPad. In the end, the design and build quality are pretty solid if you can ignore the undersized rubber feet used throughout the laptop. I personally find it unacceptable, but only because I know I’m going to scratch it up because of it – and I hate scratches. But your opinion may differ depending on how you plan on using it. For example, if you are only going to use it on your lap, this won’t matter to you at all. 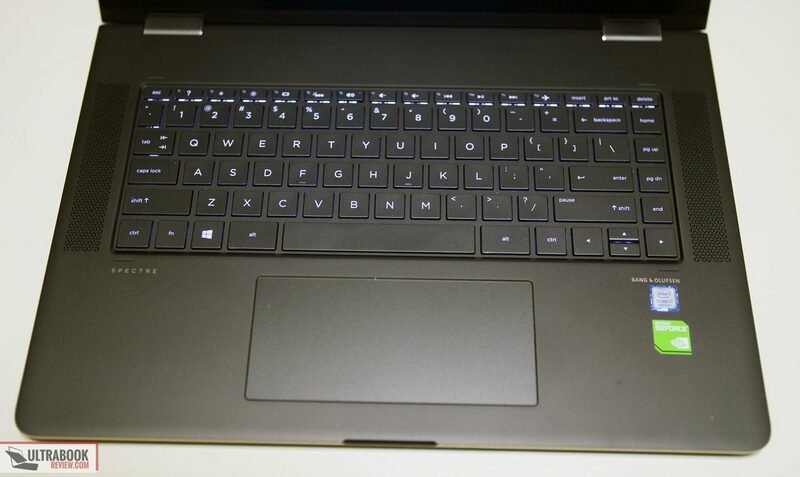 Like I mentioned before, the keyboard is very similar to the ones found on many other HP 15” models. 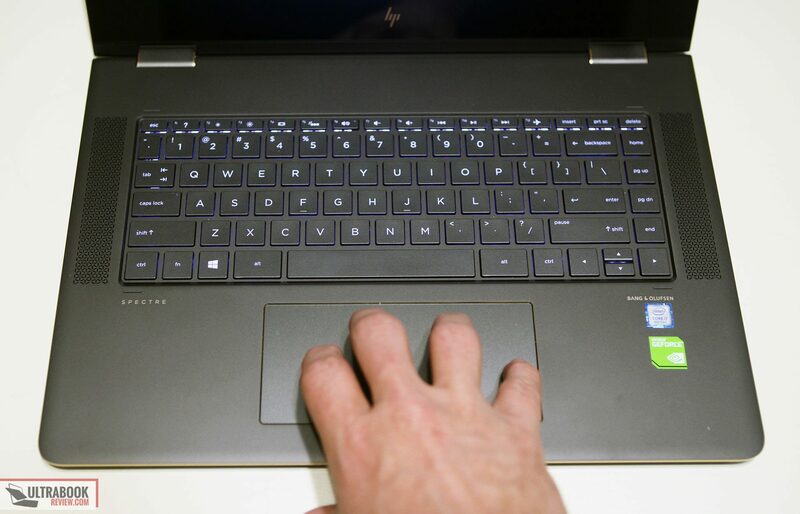 Instead of a Num pad, HP opted to leave space on the sides for the speakers. Other than that, the layout is properly done and pretty much what you would expect. The keys are well spaced and easy to type on, however I do find them a little too light to press for my taste, but I can still adapt and type normally. I measured the actuation force and ended up being 60 grams. The feedback was only 20 grams, which is probably why I thought my typing experience was too light. 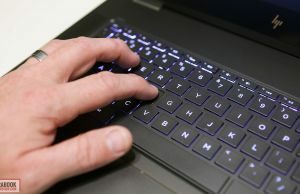 The keyboard is backlit with a color of white, which can be adjusted with a multimedia key at the top row. Unfortunately, there are no brightness settings – there is only on and off. Overall my typing experience with this Spectre x360 was pretty good. If you’re used to HP keyboards, your experience will probably be fine as well, as you’ll know what to expect. 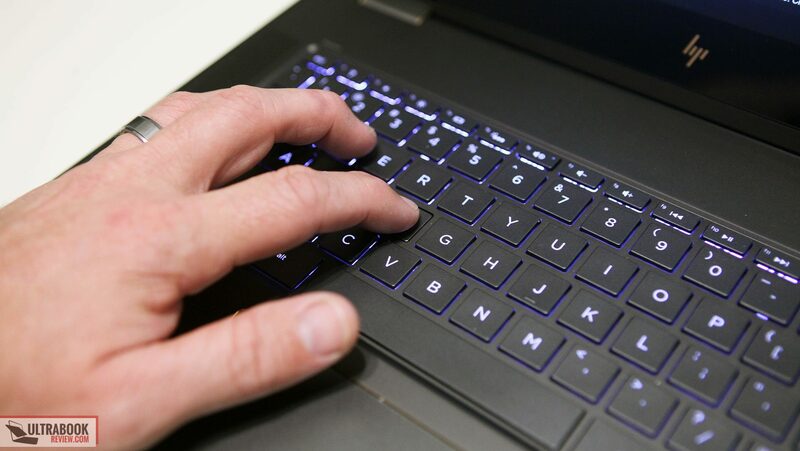 I also think most people will be fine with the keyboard, but if you prefer a heavier feedback on your keys and more travel, you might want to look elsewhere. I really can’t complain though because I was able to type 54 wpm, which is slightly above average for me. The trackpad is probably one of the nicer highlights of this laptop. Like pretty much every Spectre model, it is extra wide. This makes multi-finger gestures very easy to actuate and also allows for some more freedom to still track your pointer without your hand being as close to the center. Overall, the experience I’ve had with this trackpad has been great. The pointer is very accurate and tracks properly. Taps, clicks and multitouch gestures all work as they should. The surface of the trackpad is also very smooth and feels good on the fingers. I do have a lot of experience with this trackpad already, as I’ve reviewed a few Spectre models before. That said, I’m pretty used to the couple disadvantages of having this extra wide design. The first of which is right clicking, which is pretty un-intuitive since the right corner is farther to the right than on any other laptop. I find it easier to opt to use double taps for right clicking. The other concern is accidental touches when typing, but HP appears to have implemented some very good palm rejection with this one. The screen option on the model I received has a resolution of 3840 x 2160. It’s a UWVA screen, which is a variant of IPS. The screen model is BOE06C3, which I couldn’t find any info on, so you’ll just have to live with the specs I measured. Overall the image is crisp and the viewing angles are fantastic. There is some noticeable backlight bleed on my panel, especially on the lower left and the right sides. It’s not noticeable unless you have a black screen, so you’ll probably only see it when booting up or when watching movies. This is pretty typical for IPS touchscreens, but it’s still annoying to see in higher end models. I took some measurements on the screen with the Spyder4. The color space coverage was good, with 94% sRGB, 71% NTSC and 73% aRGB. The contrast ratio at maximum brightness was 720:1 which is also pretty good. 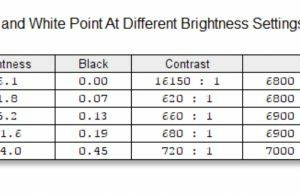 The max brightness was 332 nits, with blacks being .45 nits. It’s no AMOLED, but the blacks on the screen really blended well with the bezel. The minimum brightness goes as low as 16 nits, for optimal nighttime reading. 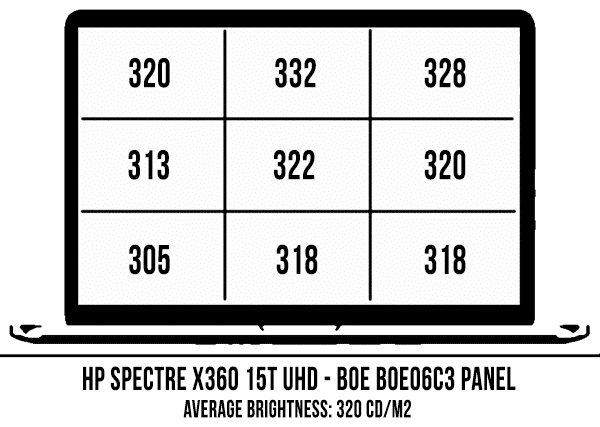 See my chart below for the brightness distribution on the panel. The screen is touch enabled, so you’ll be able to use it as a tablet if you desire. Taps and touch gestures all work properly. 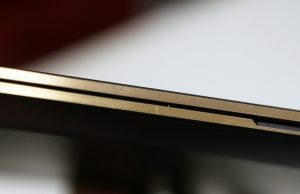 The hinge is also very strong, so there’s little or no screen wobble when touching the screen in laptop mode. If you want something more precise, there is also an active digitizer so you can write on the screen similar to how you can on a Surface Pro. I really didn’t spend that much time using the pen, but my experience with it so far has been pretty good. HP’s pen feels a little cheaper than the Surface Pro pen, but it works ok and does the job. I don’t think the pressure sensitivity is as advanced as on the Surface Pro though, so don’t expect anything more than just writing with it. Like I mentioned before, the bezels on this unit are pretty small compared to the previous model of the Spectre. 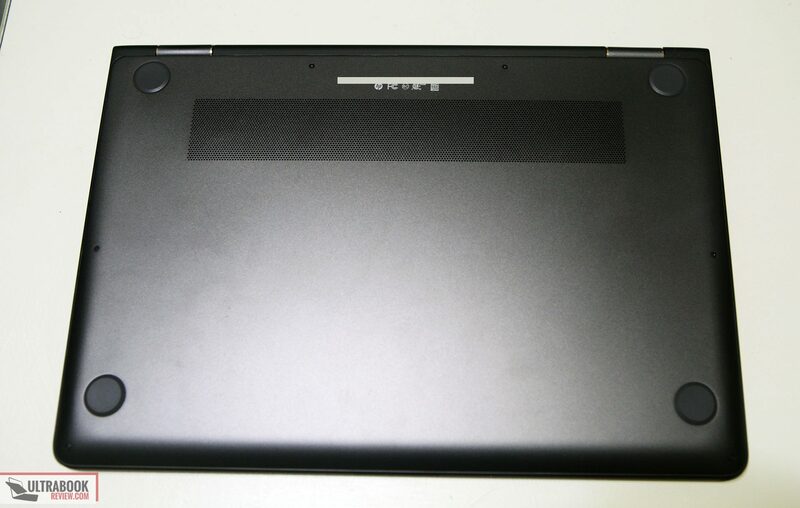 They managed to make the side bezels as short as possible, which is great to reduce the laptop’s footprint. The top and bottom bezels are still normal though. Minus the backlight bleed, this screen is very nice and adds value to the laptop. I can’t say I prefer it over the 4k screen on the XPS 15, but it’s pretty darn close. 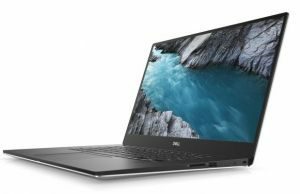 The full gamut colors, smaller bezels and lack of backlight bleed make the XPS 15 screen still one of the best ones available. But the pen input is a really nice touch with the Spectre and may be enough to sway you in this direction. You can’t go wrong with either really. 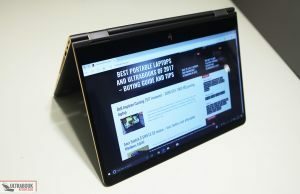 This is the first laptop I’ve tested with the 8th generation Intel Core processors. This model comes with the i7-8550U, which is pretty unique in some ways. First off, it’s not Coffee Lake like I originally thought, but is instead a Kaby Lake R(for refresh). 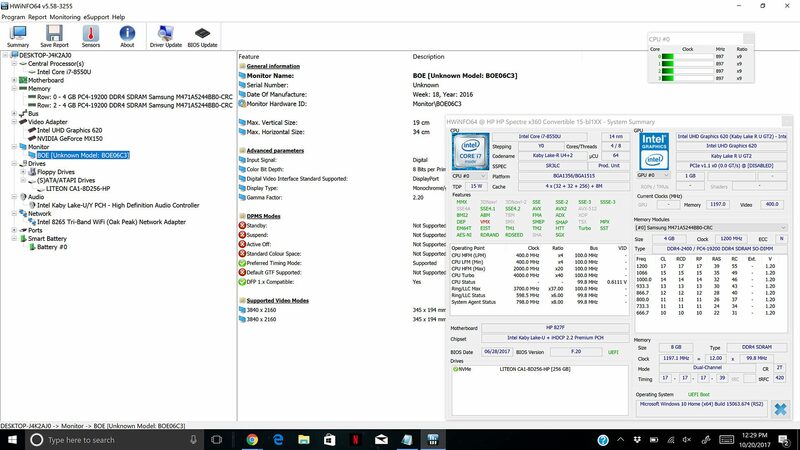 What makes this one special is the fact that it has four cores, as opposed to only two that you find on pretty much every Core U processor out there. 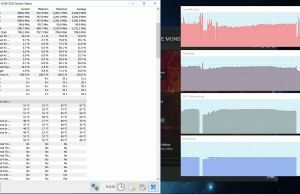 Being a quad core in an ultrabook limits the base clock speed to 1.8Ghz unfortunately, but luckily the boost clock is 4Ghz. This is fine though as the clock speeds stayed far above 1.8Ghz for most of my heavy use. More on that in a bit. This model comes with 8GB of DDR4-2400 ram. That should be enough for most people, but if you want more you can always just open up the system and update the RAM modules. There are two slots, so it’s probably safe to assume it’ll support up to 32GB. 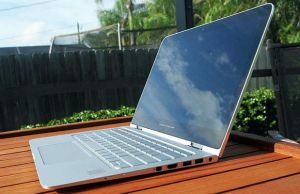 Being an ultrabook, the system will run mostly on integrated graphics in order to save on battery life. But if you have any heavier graphics intensive programs you want to run, this laptop also has an Nvidia MX150 chip onboard. It’s a lightweight graphics card intended for things like photo/video editing and maybe some light gaming. It’s limited to 2GB of Vram, which is appropriate for the card and will help save your system RAM when running graphics intensive programs. This combination of hardware is very balanced and totally appropriate for the average user. The quad-core CPU can pretty much handle anything that you can throw at it, and does so with battery saving capabilities at hand. Getting up and running from a cold boot is very quick and multi-tasking is a breeze. 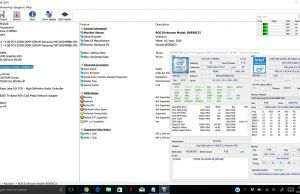 CineBench R15:OpenGL 62 fps, CPU 533 pts, CPU Single Core 133 pts. There’s a few things you can see here. First of all, the CPU gets really hot… Too hot, if you ask me. I’ll elaborate more on this in the heat section below, but HP could have done a better job with the ventilation for the CPU. At least the performance is really good though. Fallout 4– There’s a particular battle near Corvega which takes place in a foggy thunderstorm. It’s a typical spot where the framerates dip the most for me. As you can see, the Nvidia MX150 chip isn’t quite capable of driving anything past FHD gaming, as it struggles to come anywhere close to 60fps on games just a few years old. Shifting settings to low and medium is a must. If newer indy titles such as Cuphead are your thing though, this laptop tackles those just fine. Heat dissipation is somewhat decent, considering how thin the laptop is and the fact that the vent on the bottom isn’t in line with the components that need to be cooled. I did notice some thermal throttling though, especially in benchmarks, so there’s definitely some room for improvement. I originally thought the thermal throttling might be caused by the rubber feet being so short and blocking the intake beneath. I mean, I can’t even slide a piece of paper underneath the laptop, so I don’t see how that bottom vent is doing anything at all. 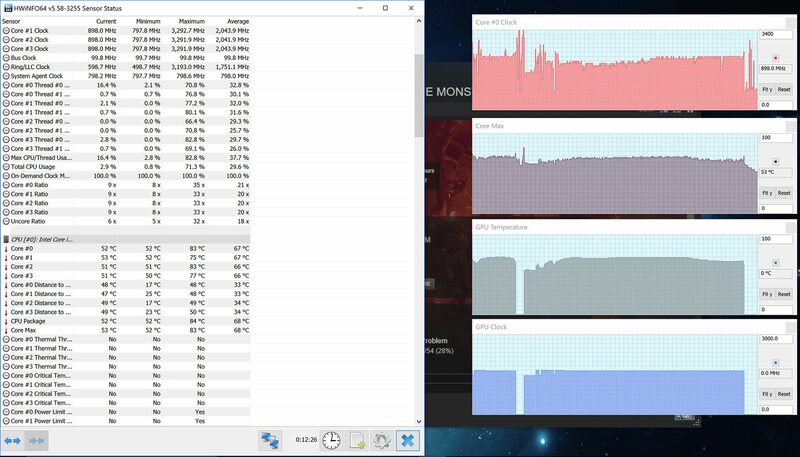 Turns out, it probably isn’t doing anything, but it doesn’t matter – even with the laptop in tent mode, my benchmarks still yielded the same temperature results. 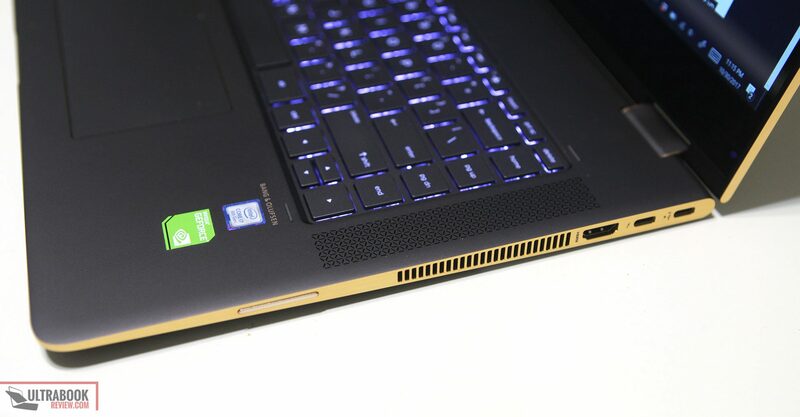 The fans appear to draw air across the laptop completely, which seems to get the job done. If I had to guess though, the CPU gets the warmer air from the GPU and that’s why the thermal throttling occurs. Another heat pipe on the CPU would probably have done the trick. As far as external temps are concerned, the fans do their job to remove enough heat to keep the casing from getting overly hot. Under normal usage, I barely noticed any change in comfort on my lap. I did notice it getting a little warm with games, but it really wasn’t too bad. See below for my results. The fans on this unit were mostly off under light loads. When they did kick on, it would only be temporary and they would shut off at the right time. In most scenarios, I never noticed the fans cycling on and off, but keep in mind that I live in Florida and I usually have air conditioning running, so it’s hard to notice unless I’m paying close attention. Radios – This unit comes with an Intel 8265 wireless AC WiFi module. The module doubles as a Bluetooth adapter, offering Bluetooth 4.2 capability. The coverage is actually excellent, as I experienced no drops in connection during my use. 25ft from my router, I maxed out my internet connection at 90Mbps. From 100ft, the speed tapered off to 80Mbps, however that is still a solid performance from my experience. 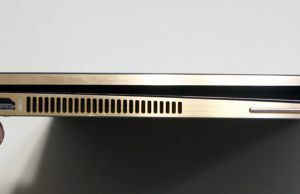 Speakers – This HP Spectre x360 has two upwards facing speakers, which come through the grills on both sides of the keyboard. The speakers are plenty loud, reaching 80dB. I did detect a little distortion at the highest settings, but it wasn’t too bad. Overall I’m OK with the sound, but the bass is a little lacking. With a sound test, the bass levels were only detectable as low as 90Hz, so you can imagine how tinny the sound could get. Webcam– A FHD webcam is included on this unit, which also doubles as a Windows Hello cam. It’s centered at the top along with the infrared blaster, so it’s pretty much aimed right at your head during normal use. After initial setup, the Windows Hello feature worked quickly and flawlessly every time. The image quality of the webcam itself was very good in my opinion. The low light quality is also pretty decent, and better than much of the competition out there. There’s not a lot I would change about this part of the laptop. The configuration I received has a 79.2 Whr battery, which is a pretty decent size considering how thin and light the laptop is. I ran my typical battery test which consists of using the stock “Power Saver” power profile, 20% brightness (90 nits), WiFi off, Bluetooth off, and running a 720p movie in a continuous loop at full screen with the volume muted. I start the clock when it’s unplugged and stop it when the unit performs a self- shutdown. 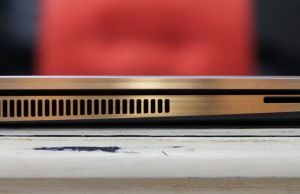 The HP Spectre x360 15t lasted 11 hours and 36 minutes before shutting down. Unfortunately, I was not able to use HWinfo to measure battery life on this laptop. This is typical of HP laptops and I can never figure out why. I can say though, that the battery life appears to be excellent for normal tasks that don’t involve using the GPU. Considering how long it lasted in my above test, it’s safe to say that this laptop will last for 6 to 7 hours for typical day to day tasks. 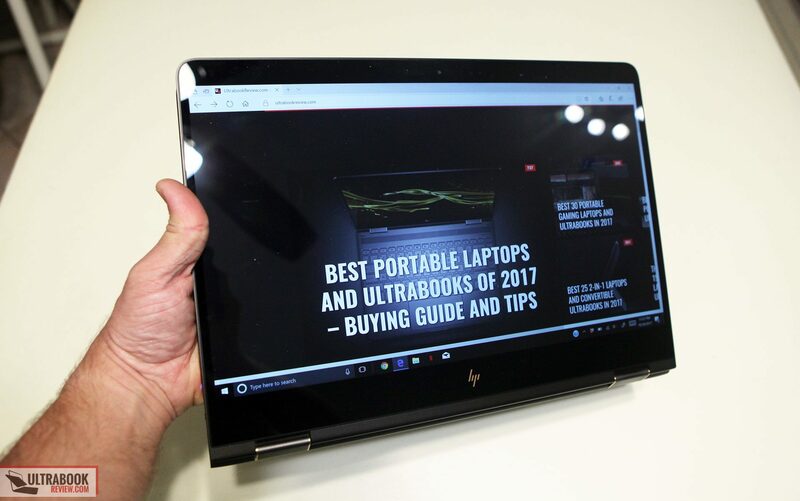 The model I reviewed is available on Hp.com for $1399. A fair price, however you might be able to find a sale occasionally. It’s also available on Amazon with upgraded SSD and RAM, 512GB and 16GB respectively. 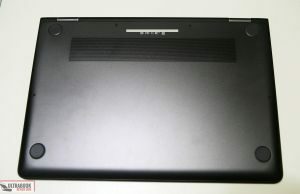 As of when this post was written, this model of the laptop isn’t widely available many other places. There are a number of 7th gen CPU models out there though and are going on sale, so it might be worth looking for a bargain in the coming months. To conclude this review, I’m very pleased with what the HP Spectre x360 15t has to offer. Considering how portable it is, this laptop has a lot of horsepower behind it, and does so without making too many compromises. I really like the fact it offers quad core performance while being efficient at the same time – it’s about time Intel got around to that and I’m very much looking forward to future similar CPUs. 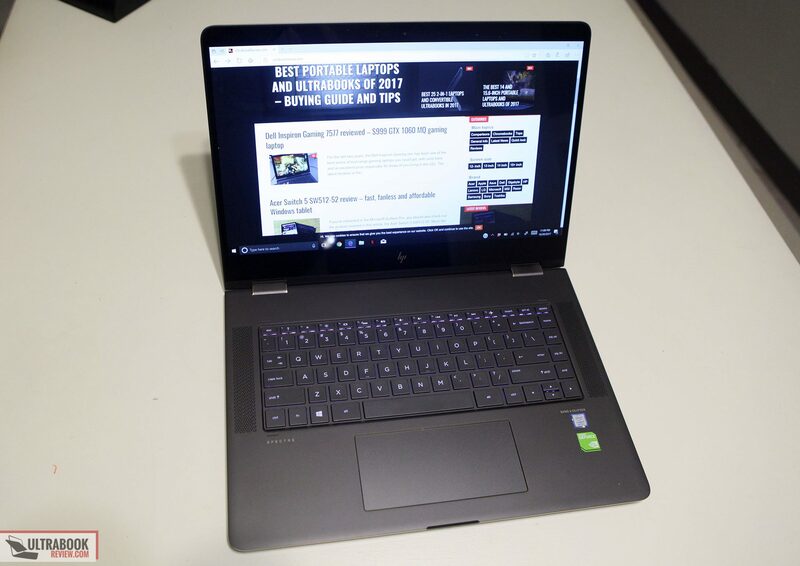 Paired with the GPU, this laptop can easily handle pretty much any typical non-gaming application you can throw at it with ease. My biggest concerns are the thermal throttling when you push the laptop to its limits. 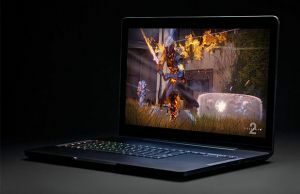 I really don’t think this will affect many people, as it only seems to happen during benchmarks and maybe some really heavy gaming – both of which really aren’t what this laptop is for. Unfortunately there isn’t an i5 version of this laptop yet, but if the heat really concerns you, perhaps undervolting or limiting the turbo will solve the issue. My only other annoyance with this laptop is the rubber feet on the bottom. I’m a pretty careful person with my electronics and I hate scratches. The proximity of this laptop to the desk is absolutely absurd and I just can’t see how I could possibly own this thing for even a month without getting scratches on the bottom. HP really needs to address this. Gripes aside, there’s a lot to love about this HP Spectre x360 15t. 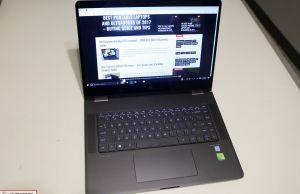 It carries a lot of the things I liked about the 13” version, including the ability to fold back the screen, the super large trackpad and a solid keyboard. The screen is excellent to look at and it also has an active digitizer. If you’re in the market for a 15” 2-in-1 notebook you can write on, there really aren’t many other options out there. So that about sums it up. Please let me know if you have any questions in the comments section below, and I’ll be happy to answer them. In addition to being a tech enthusiast, Derek has a career as a biomedical engineer. He enjoys taking things apart, figuring out how they work and finding ways to make them better. His other hobbies include spending time with his family, "Do it yourself" projects such as home automation and running. Would it not be easy to replace the feet with an after-market version that would allow for more space under the laptop? Alternatively, one could use shallow plastic cups that cover the feet and serve as alternative feet. I use ones that I purchased from Home Depot and that lifts my laptop up about 0.5" off the desk and that allows for better ventilation under my Asus 305UA laptop. Easy to replace, sure, but getting someone to make them the exact size would be challenging. The feet are held on by a very thin piece of double sided tape, so it wouldn't be too hard to get another foot to stick onto it. From my experience though, if you don't key the feet and size them correctly like the originals are, they'll come right off once they snag on something(Which would happen a lot when dragging your laptop on a table. 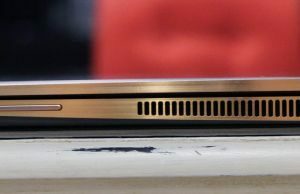 Derek, I have been through three of these HP Spectre x360 15 laptops in a month. First: Bright cloudiness in lower right hand corner during normal use. Second: Gritty unfinished feel on surface with hand prints and a tape mark in the finish. Scuffed HDMI port and way too much give in the mouse pad. 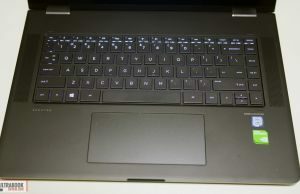 Third: This one arrived the same day this review was posted, the front feet were so low the front of the laptop rubbed on any surface it was placed on. The ventilation intake was completely blocked causing the fans to constantly run. Also, Samsung SSD drive not present.. instead Toshiba SSD was used. Number 4 is on the way.. fingers crossed. Brutal… I didn't see the first two issues you had but I definitely understand the third one. Hope the next one works out. Thanks! I can definitely say the first and second had adequate clearance for ventilation. So yeah, either the front feet have changed (perhaps a defect in the current production run) or the rear and front feet were accidentally swapped. The rear feet are thicker, raising the palm rest. The change in SSD manufacturer was sudden and unexpected. I'll keep you posted. Well #4 was a dud. The "new" machine arrived earlier in the week from HP with smudges, fingerprints, swipe marks and suffered the same issue of being way too low on a surface. Returned and refunded. I decided to give Best Buy a try. I found the laptop online with delivery for $400 off of their retail price (and cheaper than HP's price) for Black Friday. Number 5 arrived yesterday flat as pancake with no visible light to be seen underneath from the side. The sound of the scraping on my desk was very pronounced on that unit and the fans ran non-stop. I returned it today and one of their Geek Squad members took a look at it. They were stunned and they too could see no clearance whatsoever for air to flow and heard the scraping noise when they slid the unit on the counter. They exchanged it immediately this morning. So now, here I am on Number 6. This unit has way more clearance for airflow but there is an ever so slight bow in the base cover where the intake vent is, dead center, that lightly touches any surface I put it on. The fans aren't working as hard as before; good sign I guess. After a couple of hours of updates installing, the fans rarely come on full throttle unless I "push" the machine hard. One nice surprise… this unit has a Samsung PM961 in it! This machine seems to be more in line with my first unit from a month ago. The screen, finish and hinges are pristine out of the box on with this one. I hope no one else has to go through this. Come on HP! You can do better! How did you find out what SSD model should be there? I was looking at specs across the web and there is always a generic description. what makes the Samsung better than the Toshiba? If you look at my HWinfo screenshot, you can see the SSD model. In this case it's a LITEON drive. I'm not sure why people criticized a Toshiba drive. Perhaps it's a sata drive and not nvme? Some drives get really hot under load so that might be the case in. Either way, this drive was neither of those. I'm not sure. I don't think they models earlier this year came in that color. So, now that Intel chips are 'violated' — what does it mean for someone who wants to buy a new laptop? especially to the tune of $1500? the patches seem to address part of the security vulnerabilities and a new design is not anytime very soon. is it worth waiting for it? Do you know of any model in the 13" to 15" range that is equipped with an OLED display? Btw: Thanks for your excellent reviews with lots of information! The old Skylake 13" model was supposed to have an OLED QHD panel option but I never saw them go up for sale in the US. I've only seen them for sale on eBay, which makes me wonder if only certain markets received them. I am truly a fan as i love music and playing online games and this gadget comes with speakers to either side of the keyboard complete a very visually pleasing dec and it is running on seventh gen Core i7 (U series and have 16GB of Ram and 512GD SSD and also Nvidia 940 MX which makes it ideal for gaming.